One major reason why the National Sevens was being played for the last time last weekend is the massive success of the Bournemouth Sevens - dozens of men's teams and over 30 women's teams playing over a weekend festival that offers not only highly competitive rugby, but also music and other entertainment. Among the participants were Wonky with a Letchworth team, and also probably the first ex-Legend to play at Bournemouth - Rosie Randfield, who played for REME - and pretty successfully, going by the team picture (below). Katie, Nikki, Jess, Jade, Sasha, Mel, Randy, Carla(? ), Chloe(? ), Claire (?). Still plenty of room for more - so please ask around. Friends also very welcome! The final girls rugby event of the season took place at Harpenden RFC on Saturday where Letchworth girls claimed medals in both U18 and U15 events at the RFUW National 7s. Full report on the National 7s will follow shortly. Something that may have escaped everyone - this (unless there are some dramatic changes) will be the last National Sevens. The calendar for next season includes no such competition next year - there is an "Easter Sevens" for junior teams, but its difficult to see how it can replace the Nationals when it will be clashing with both family holidays and exam preparation (does no-one at Twickenham have children?). There will be no official adult sevens - indeed there hasn't been one since 2008 anyway, which is odd as the format is clearly popular (at least in competitions not run by RFUW) - there will be over 30 women's teams playing in Bournemouth this weekend alone, not to mention a growing number of other events this summer. In fact it is quite odd the way that RFUW is all but abandoning the Sevens format when the rest of the world is moving towards it. This is already the most downbeat National Sevens I have ever experienced. For the first time we have no idea who we will play as the website has no information (well, none that I can find), which is a huge shame as this has always been a great event, and the anticipation about who will be there is part of that. I've no idea how long its been running - since well before 2004, though, that is for certain. Fortunately for us most of the time its been played in and around this area - Harpenden or Leighton Buzzard - though in 2004 it moved, on trial, to Northumbria. There is no list of past winners anywhere - senior or junior - though I would guess that Worcester have won more than most, with other clubs like Darlington and Basildon taking the odd title. For those who have not been before the tournament, in terms of player and team numbers, is indeed now smaller than Herts 7s - but in terms of intensity and competition its in a different league. There are no easy games at the Nationals - its rare that a bunch of totally green complete beginners turns up to have go (apart from in 2005!) - the standard of play is normally very high, pretty much across the board. Its a brilliant social event as well, with players and officials from across the country meeting up, and its an emotional event too as many girls pull on their club colours for the last time. It also normally rains - sometimes quite a lot - and by the sounds of it this year may at least follow that tradition. So - what's this Rugby League, then? First - the obvious, and maybe cosmetic, ones. League is 13-a-side - no flankers, essentially - and, for some reason, the players are numbered in reverse (1 is the full back, while the scrum numbers from 8 to 13). Most positions have roughly the same names - except our "No. 8" becomes League's "lock". You also only get four points for a try, two for a penalty (or a conversion), and one for a drop goal. There aren't any. Replaced with a scrum, 20m in from the line. Uncontested, five-player affairs. The team given "head and feed" always wins - and most of the time the ball seems to be fed straight to the second row! There aren't any. Apart from one-on-one tackles, you cannot steal the ball from the ball carrier. If more than one defender tackles an attacker and takes the ball then that is a penalty! There aren't any (well, not as we know them). If an attacker is tackled to the ground, or just held so they cannot go forward, then that is a tackle and play stops for a "play the ball", which you will all recognise from playing Touch. However, the area where the "play the ball" is happening is (confusingly) called a ruck. The same, but obviously you do not release the ball after a tackle - and after six tackles you hand over the ball to the other team. You cannot deliberately "go to ground" in League, but you can shoulder charge an opponent - barge them over, in effect. You can also use your legs to bring someone down once you have grabbed hold of them. If you are tackled near the line you cannot reach forward and put the ball down - this is a "double movement". Those seem to be the major rule differences, but overall the key difference is that in Union territory - where you are on the field - is the key, while League is all about possession - gaining as much ground as you can while having he ball, and restricting any gains the opposition may make while defending. In Union you can almost always compete for possession - in League you generally cannot. Obviously there will be quite a few tactical differences as a result - for example, from a restart the kicking team will normally try to kick the ball as long down the field as possible. RFUW have announced more details about their "proposed"* junior leagues for next season. Okay, so far so good. A brief glance at this and it looks quite reasonable - even exciting. Not too many teams, not too many long journeys, guaranteed fixtures - great, eh? However, let's dip below the surface a bit and see how this House of Cards stacks up. Let's take our league. Five U15 and six U18 teams - so that's eight and ten fixtures respectively, mainly against clubs we know pretty well (Lakenham excepted). Err... no. Fact is that we do indeed know these clubs pretty well and - at a reasonably educated guess - I reckon that next season there will be just about sufficient girls at all the clubs put together to form two U15 and two U18 teams. Maybe three if we are lucky. You see a fairly fundamental flaw in all this is that the RFUW - if they are considering player numbers at all - seem to be either looking at membership categories or maybe at player registrations. Trouble is that we know that both are (for reasons that need not bother us here) pretty inaccurate - even for the current season. But when applied to next season, this season's player numbers are so meaningless that they are close to complete fiction. This is not adult rugby. Major clubs one season are often shadows of themselves the next - indeed they can disappear altogether. Remember Fullerians, the first winners of Herts 7s, providers of a string of England U19s, one of the best teams in the country in 2005... non-existent by 2007. And that is far from an unique example. In short some - most? - of these leagues are, or will be, complete fictions. Many of these teams will only exist on paper because the clubs involved knew that they had to "express an interest" as otherwise they'd be shut out of the process. Better to be safe than sorry - send the form in. Doesn't mean that they'll have a team though. There are ways around that, of course. Given some flexibility the SW League's systems could be used - gather all the girls together at one club on each league day and sort of the teams from there. Could still be good. Teeny snag is that, of the many adjectives that might be applied to RFUW, "flexible" is not one that immediately springs to mind. However, in theory that is fixable. It just needs a bit of imagination. What is not fixable might be summed up in the traditional toast of "absent friends". To take only Hertfordshire, where is Royston? Where is Bishop's Stortford? Where is Stevenage? Not major sides - yet - but Royston is reported to have over 20 U15s next season. That will be 20 U15s twiddling their thumbs, because they won't have many teams to play. The leagues will make sure of that. Okay, their decision, you may say. Maybe they are not RFUW affiliated anyway so did not get the paperwork, maybe they did not want to take part, maybe they are a shade "administratively challenged". Their problem. Bit if a shame for the girls, though... really good for development... let's kill off teams because they cannot get their paperwork straight. Nice one. But that too is peanuts, frankly, behind the biggest problem. And to illustrate that - I'm sorry - its down Memory Lane again. We were formed in 2004 on the back of a tag team that played at Herts Youth Games in June of that year. Based on that success we pulled a team together in September 2004, playing our first game in October, and racking up an average of a game every two-three weeks right through to the end of May. We went from nothing to one of the strongest U14 sides in the county in those few months. These leagues would make that impossible. Utterly impossible. No new clubs will ever be able to follow the our path (which is far from unique). They would need crystal balls (or a spare Tardis) because entries had to be in by the end of last month. In April 2004 Letchworth didn't know that it would have a girls team the following season. In short - this is great on paper. Sounds wonderful. But then most fantasy is a great read - trouble is that being an exciting read doesn't make it real. And when we get back to reality the truth is that this has the potential to be a disaster. A system that will exclude and kill off new clubs, while gradually watching the existing club game fade away. Remember - on average a third of all junior teams disappear every two years. Its an unfortunate statistic - and the best that can be said is that the leagues will do nothing to stop it. Bottom line? The RFUW clearly do not remotely understand junior club rugby - they seem to think its like the adult game when it could hardly be more different. It is no exaggeration to say that this needless centralised tinkering - this one-size-fits-all solution to a problem that does not exist - has the potential to kill the game. To sum it up - if these leagues had existed in 2004 you would never have played rugby because Letchworth Girls would never have existed. Its as simple as that. *"Proposed" as in the sense of "I have a gun to your head and I propose that you do what I tell you". "If it ain't broke don't fix it" - or actually the club game has been doing okay so far. Not perfect, but not too bad. There are a few problems - the "Superclub" problem in particular, with talented girls being stolen from "small" clubs by "big" clubs with coaches and parents (and its normally the coaches or the parents - rarely the girls) who are obsessed by winning. There are ways or doing things about that - and one problem with the leagues is that this will make things worse! If the RFUW really want to help develop the club game then the best thing is one-off festivals, not leagues. Encourage and organise regular festivals throughout the year - 7s, 10s, 15s - maybe one a month in each Division. Everyone enjoys festivals, they are fun, and clubs big and small can take part (or not) in each festival as the wish, combining with different clubs (or not). In between the festivals, friendly fixtures (or independent leagues, if clubs wish to form their own - up to them). RFUW could perform a vital role by running a fixture bureau - matching together teams with blank dates. A season of festivals and friendly fixtures would give the flexibility the game needs. New clubs could develop and grow from festival to festival - maybe making a Bowl final here, and Egg Cup there - while established sides could aim for tournament championships. In between clubs arrange games against teams of appropriate standing. Simple, flexible, fun - and much less pressure to create SuperTeams. Legends reunited this summer? Volunteer now! A few past and present Legends have already shown some interest (even quite a lot of enthusiasm!) about the idea of getting together for one of the RL festivals this summer. Wonky is also on board (work permitting) to help out - which would be useful as Rugby League is a bit different! Currently waiting for further details about what would be involved, but in theory anyone from any current or past U18 team could probably play, entry is FREE!, and all of the tournaments will be within fairly easy reach of Letchworth (the "worst" being one in Carshalton, in south London). The first is on 12th June - which is a bit close, but not impossible if enough of you come forward in the next week or so - and the second in St Albans is on the 26th, which sounds very possible. So if you are interested please let me or Mike know as soon as possible. At this point we aren't asking you to commit to play on any particular date, but if this is a non-starter the sooner we know the better (saves on lots of hours of admin!). Non-Legend "guests" are also welcome, especially if that will help us make a full team - so by all means ask around - but ideally I think we'd want to field as near a full squad of past and present wearers of the black-and-amber as we can. Want to carry on playing this summer? Feeling at a lose end this summer? Touch rugby not quite cut it? Missing the impact of the real game? In that case there may be an alternative to watching the grass grow. As predicted in recent months, the Rugby Football League is launching a London & SE Merit league. Where last year there was a single London club, there are now (at least) four, with an invitation to enter more. Hertfordshire supplies one of these new teams - St Albans Centurions - managed by someone called Tony Bottomly (TBotto3982@aol.com or 07876143566). In addition there will be teams in south London (South London Storm) and North London (London Skolars, in Wood Green) who will join the existing West London Sharks. Each of the four teams will be running festivals in June and July, with the teams with the best record competing in a Grand Final in August. The RFL are throwing a lot at this. For example, all players and club officials/volunteers attending the first festival at West London Sharks on 12th June will get free tickets for that afternoon's Harlequins/London Rhinos game, as well as referees and match officials for the festival itself. Although these are adult clubs, "adult" in RL terms seems much more flexible than it is with RFUW - from reports I have seen 16 year olds are playing for some clubs, and even if you are under 16 the more demand the more likely it is that girls teams will be formed. For general information about specifically girls RL contact aran@quinsrl.co.uk. Obviously Rugby League is a bit different to Union - the tight five in particular may find adapting to it a shade difficult - but most back row and backs should not find switching codes too difficult, and as the calendar for the RL season does not overlap with the RFUW season at all (unless you are in a TDG or HPA maybe) it will not interfere with any winter club rugby. More information from the above contacts, or Steve Davis (steve.davis@rfl.uk.com or 07703105381). There are just 3 training sessions remaining before our final games of the season at the National 7s which is on Saturday 29th May. These training sessions will give a great opportunity to practice the 7s game which is very different to the 15 a side games we are used to playing throughout the season. Please make every effort to come to these sessions and finish off the season in style with a great National 7s! The World Cup may be on he horizon, but for most of Europe their international season is reaching its climax now. Last weekend the XVs season came to an end with Spain winning their third European title, beating Italy 31-13 - and this weekend its the Sevens. Remarkably Spain have finished in the top three ten times since FIRA began running an annual XVs tournament for women's teams 15 years ago - a record that is superior to every other European nation. Admittedly England do not always enter, and they and France normally send understrength squads, but without doubt Spain can claim to be in Europe's top six, and possibly top four, based on the results in the last Six Nations. It all makes their absence from the Six Nations seem all the more unjust. Italy replaced them three years ago now and, for all of Italy's recent improvements, Spain have beaten them every time the two nations have met. Such is the politics of Europe's rugby - you do not always get what you deserve. Another oddity about European rugby is the attitude of the home nations which does, at times, seem arrogant and dismissive. FIRA's annual tournament is vital to the development of the game across the continent, and this was the fourth time France have hosted it. Italy have also hosted four tournaments, Spain three, Sweden two... how often has the tournament been held in any of the home nations? The answer - remarkably - is never. The continent's biggest rugby nations have never hosted FIRA's annual festival, or shown any interest in doing so. Whatever this says about England, Scotland, Wales or Ireland's attitude towards the development of the game in the emerging nations of Europe its clearly not very supportive. Perhaps the RFU/RFUW don't really want anyone else to play? Not only have the British and Irish Unions never host a European XVs championship, they have never hosted a Sevens either. Fortunately for the continent's rugby future countries like Serbia, Bosnia, and - this year - Romania, Denmark and Russia are happy to step in and fill the gap. You can see the full draw for this weekend's tournaments - and the Top Ten (which includes England) - on the FIRA website. Click here. Tournaments that require getting up before 7am on a Sunday morning are always going to be met with a grumpy Wonky! The Herts 7s was definately going to be a big learning curve for the U15s as it would be the first time most of the team would encounter the unforgiving nature of 7 a side rugby. It was a lovely summer day with concrete pitches which saw us lose two of our players early on in the tournament. The learning started early with the girls playing too much contact and tiring themselves out but the early matches were good competitions and results were close. After only two games there were numerous grazes, skinless elbows and knees which seemed to be the order of the day and the odd tear was shed but understandably so. After all, England's men do not play this time of year as the pitches are too hard! Towards the end of the tournament, play started to look more like sevens rugby with the ball being moved and avoiding contact being definately more visible which is a good thing. But the excessive contact, rucking and mauling of the first games definately showed in the last few - support was far behind and thus opportunities to score were missed. The day was a day of firsts : Holly managed to score her first try, Florie was able to cry on three separate occasions as opposed to the usual one, Sydney scored what must be a record 13 tries and Jess charged an opposition winger narrowly into touch saving a certain try. There was a lot learnt at the end of the day and now that all the girls have had a touch of 7's we can all get to work over the next two weeks : fitness is king girls - lets all make it to training so we can hit Nationals hard!!!! Tries : Sydney (13), Melissa (2), Ellie, Holly, CJ, ??? Anyone know the missing scorers? If so please let us know so we can fill in the results panel properly! 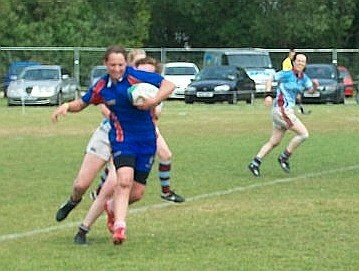 This year's Herts 7s was hosted by Tring Rugby club on what is traditionally a hot early summer day. Traditions are there to be broken, I suppose, as the day was mostly cloudy with occasional rather heavy downpours. No good for the suntans but much better for playing rugby in! Nevertheless the ground was quite hard and rather sandy so a number of bumps, bruises and grazes ensued. The Letchworth Saracens U18s were drawn in a group with Aylestone St. James, Herts Baa-Baas and Rochford Hundreds. Given that Rochford had recently beaten Letchworth Saracens quite comprehensively in the 15 a side version of the game, this was clearly not going to be an easy group! The first game was against Aylestone St. James and Letchworth Saracens got off to a good start with a 20-0 victory. Second up was the Rochford side who were, as expected, a force to be reckoned with. Letchworth Saracens put up a very strong game and defended magnificently against this high quality opposition but could not deny the Essex girls a well deserved victory by 0-20. Regrettably, an injury to Claire saw her sidelined for the rest of the day. The final group game against Hertfordshire Baa-Baas was a bit of a surprise as part of the opposition appears to comprise of players who had been playing for Welwyn earlier (and indeed played for then later on as well)! As football commentators are often heard to say, this was a game of two halves : the first half belonged to the Baa-Baas and the second half saw a resurgent Letchworth Saracens begin to take back control. It was a really good response but the four try advantage that Herts Baa-Baas took into the second half was just too big to overhaul and the game ended 10-20. And so, at the end of the group matches, Letchworth Saracens found themselves in 3rd place and heading into a Bowl semi-final against Thomas Beckett. This was a game in which Letchworth Saracens took an early lead through Jess and never looked back, running in 5 tries to take the game 29-0. The Bowl final against Paviors was a very keenly contested, evenly balanced, rainy affair which was still scoreless at halftime. Early in the second half, Letchworth Saracens took the lead with a converted try but were then put under strong pressure by a commited Paviors side that was clearly not going to give up easily. Letchworth Saracens put up a resolute defence but, with just a couple of minutes to go, Paviors determination paid off and they crossed the line to close the score to 7-5. Then, in the final minute, Paviors scored again to take the Bowl by 7-12 and make it a very disappointing finish for Letchworth Saracens. The "Wonky's Words" Letchworth Saracens U15s report will follow shortly. Posters advertising women's rugby internationals and tournaments invariably feature exciting action photographs. There are lots of examples - including the one from FIRA the latest European Trophy. However, the poster they are using to advertise today's finals is a bit different (right). What do you think? I'm not entirely sure it works - and I certainly cannot imagine RFUW will adopt a strategy remotely similar for the World Cup - but it is interesting to see a bit of humour being tried. The main surprise of the Trophy itself has been the failure of the French A team to reach the final. In fact they only managed third place in their group, losing to both the Netherlands and Spain. As a result there has been a quick reorganisation of venues for the play-offs so as to ensure that the French play at the biggest stadium! Their game will now be a warm up for the final this afternoon between Spain and Italy. Sweden - the only World Cup team in the tournament - narrowly lost to Italy and will now play Netherlands for third place.